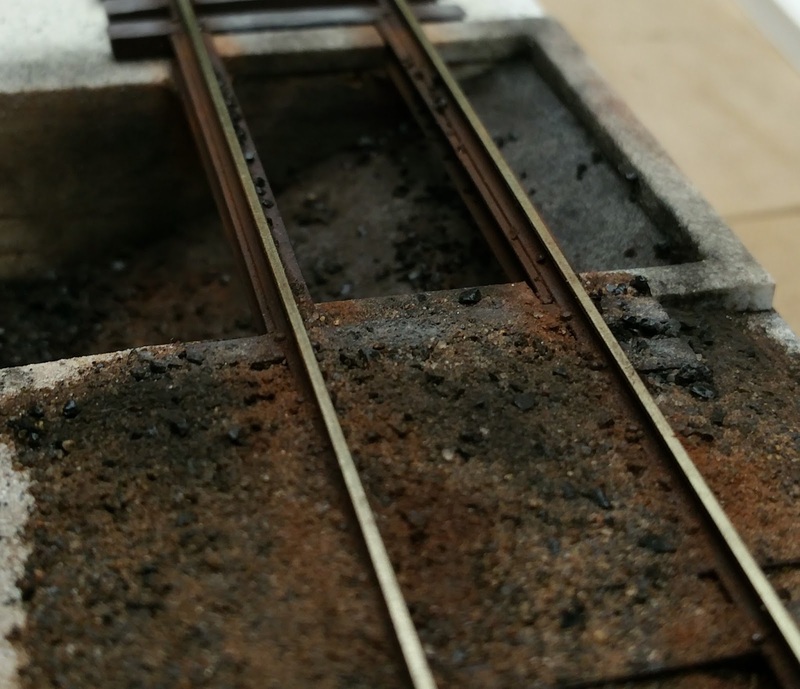 Last week I started mocking up a basis for in-ground coal hoppers. I haven't found too many pictures online, and the ones I'm modeling are no longer there. So I've loosely based it off of a Fine Scale Miniatures design. I just used parts and pieces I had on hand, including bits of masonite (base and side wall), 1x2 for the main side walls, heavy card stock for the slope sheet, and styrene for the border and to scratchbuild the I-beams. The concrete frame isn't complete, and I will install bars that parallel the track for safety. Bill suggested that the I-beams should be deeper, which will be easy enough. I just used what I had on hand. I might bring the concrete frame to rail-head level. So, the track and I-beams (which are attached) used my now standard coat of Rustoleum camouflage. 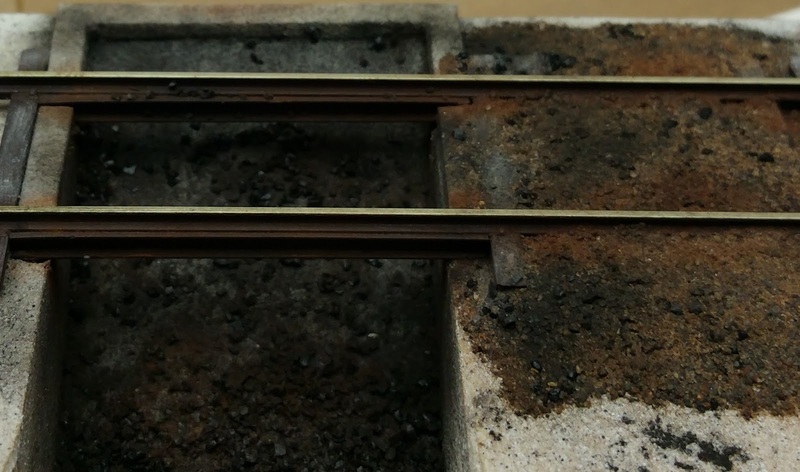 Ballast is a mix of genuine New Britain dirt, Scenic Express light limestone ballast and fine and medium coal, along with some charcoal grout. The concrete is sprayed with Rustoleum Multicolored Textured spray paint. It doesn't list a color name, but it's a concrete-like off white with multicolored flecks and a sandy texture. It goes on very thick, so it won't work with anything that has detail you need to retain. Weathered with Pan Pastels and charcoal grout. Overall I'm extremely pleased with the results of the test. I have at least two to build on the layout when I get to those portions.